Ohio City, Tremont to Hire a "Safety Coordinator"
"I was just hiding behind the couch! 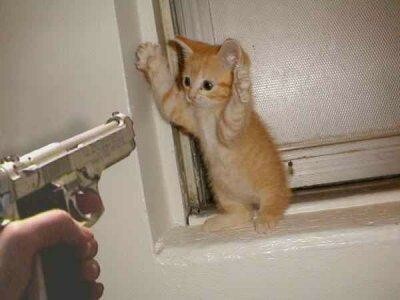 Don't shoot!" Tremont West Development Corporation and Ohio City Incorporated are teaming up to hire a Safety Coordinator. The new hire will work with residents in both neighborhoods and with the Cleveland Division of Police's Second District to address safety issues and initiate safety-related programs. Via a job posting, the Safety Coordinator will manage existing safety programs, including the safety camera program, and will work to raise funds for new safety-related causes within the near west side neighborhoods. The safety coordinator will respond to resident needs — Busted sidewalk? Call the Safety Coordinator! — and liaise with individual block clubs and the police. You can send your application materials to careers@ohiocity.org, with “Safety Coordinator” in the subject line. Applicants will be accepted through Tuesday, January 31st at 5:00 p.m.
Cleveland City Councilman Kerry McCormack, a former Ohio City Inc. community relations dude, will no doubt be relieved to siphon off a few phone calls from residents with "non-emergency safety issues."